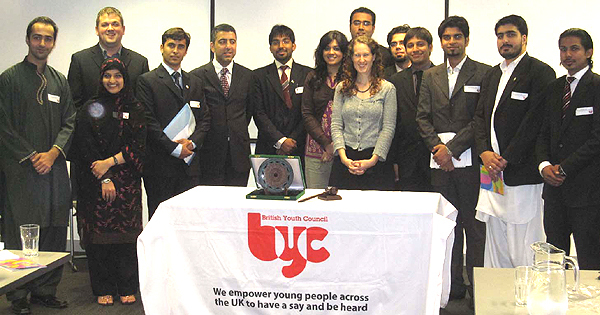 The Study Visit of the 15-member delegation of the Youth Parliament Pakistan to UK was concluded in London on July 24. In a farewell dinner hosted in the honour of the delegation at the Pakistan High Commission, H. E. Syed Wajid Shamsul Hasan, High Commissioner of Pakistan to the UK, termed Youth Parliament and its initiative as essential to the sustainable democratic future of Pakistan. The Study Visit of Youth Parliament Pakistan to UK that took place from July 19-25 was organized and facilitated by PILDAT, the secretariat of the first-ever Youth Parliament Pakistan and had the active support of the Foreign and Commonwealth Office, UK through the British High Commission, Islamabad. A distinguished member of the Youth Parliament Steering Committee, Honourable Mr. Faisal Karim Kundi, Member and Deputy Speaker of the National Assembly of Pakistan, was part of the entire 5-day Study Visit of the programme while Ms. Anusha Rahman Khan, MNA (PML-N), another member of the Youth Parliament Pakistan Steering Committee, took part in the proceedings of the first day of the Study Visit while on a personal visit to London. The Study Visit, the objective of which was to understand the working of the British Political System and engage in a meaningful dialogue with the British youth counterparts, especially the Pakistani Diaspora, on issues of mutual concern and interest, provided opportunities to the delegates to understand the working of the British Parliament and various political parties, especially the key political parties and their youth affiliates such as the Labour Students and the Conservative Future, interact with the British youth organizations and engage in a dialogue with the Pakistani-origin and Muslim community organizations active in the UK, how civil society organizations hold the democratic system and the government to account or lobby for various causes such as the environment and the human rights, how the executive branch works and how media freedom is protected in the UK, etc. The week-long Study Visit provided opportunities to the delegates to witness phenomena such as Multi-culturalism in the UK, accountability of the executive, both by the Parliament as well as by the media and the civil society organizations, tolerance for others’ views, secularism, organization and working of the political parties, especially their youth affiliates and their role in the decision-making tiers of those political parties, rule of law and equality before the law and the tradition of scholarship, dialogue and debate in the British society. Youth Parliament Standing Committee on Information; Mr. Farrukh Jadoon, YP13-NWFP01; Member, Youth Parliament Standing Committee on Education, Health and Environment; Ms. Kashmala Khan Durrani, YP-03 Balochistan-01; Deputy Speaker, Youth Parliament Pakistan; Ms. Maria Ishaq, YP26-Punjab07; Chairperson, Youth Parliament Standing Committee on Culture, Sports and Youth Affairs; Mr. Muhammad Abdullah Zaidi, YP53-Sindh 05; Member, Youth Parliament Standing Committee on Foreign Affairs and Defence; Mr. Shahbaz Zaheer, YP63-ICT03; Member, Youth Parliament Standing Committee on Finance, Planning Affairs & Economics, Syed Muhammad Nishat-ul-Hassan Kazmi, YP20-Punjab01; Shadow Minister for Law and Parliamentary Affairs, Youth Parliament Pakistan; Dr. Umair Farrukh Raja, YP36-Punjab 17; Chairperson Youth Parliament Standing Committee on Education, Health and Environment; Mr. Waqar Nayyar YP-05 Balochistan-03; Chairperson, Youth Parliament Standing Committee on Foreign Affairs and Defence. Mr. Faisal Karim Kundi, Member & Deputy Speaker National Assembly of Pakistan and Member Youth Parliament Pakistan Steering Committee was part of the delegation while Ms. Aasiya Riaz, Joint Director, PILDAT and Mr. Hammal Dostain, Programme Officer, PILDAT represented the Youth Parliament Pakistan Secretariat. The delegation, which began the first day of its activities at the UK Parliament on Westminster on Monday, July 20, was given a detailed tour of the Houses of Parliament and the history and significance behind various Parliamentary traditions. Mr. Eliot Wilson, Clerk Public Office Bill, briefed the delegation about how the UK Parliament works and answered various questions. A briefing on Parliamentary Standards and Privileges by Ms. Alda Berry, Registrar of Members’ Interests, was also given to the delegation. The delegation held detailed meetings and interactions with Lord Ahmed of Rotherham (Labour) and Baroness Varma (Conservative) in addition to watching proceedings of the House of Commons and the House of Lords. On the second day of the Study Visit, Tuesday, July 21, the Youth Parliament Pakistan delegation held a variety of meetings and interactions in London including community organizations such as the Stockwell Green Community Services and The City Circle; the National Green Party and the Local Government Association, covering subjects such as community cohesion of British Muslims, the politics of environment and the local government system in the UK. In its interaction with the Stockwell Green Community Services (SGCS), the Youth Parliament Pakistan delegation was briefed about the work of the SGCS by the CEO and the team members of the SGCS. The Mayor of Lambeth Councillor Christopher Wellbelove welcomed the delegation at the Lambeth Town Hall. Mr. Toaha Qureshi, CEO of the SGCS briefed the delegation that the SGCS is a community based voluntary organization rendering its services since 1999 to the disadvantaged and socially excluded members of the community with multi-ethnic background particularly Muslims in the United Kingdom and Europe. The SGCS has successfully executed various educational/recreational, sports and capacity building projects by offering support to children, youth, men, women and elderly people for their social inclusion and integration into the mainstream society. The Youth Parliament delegation met and interacted with Ms. Andleen Razzaq, Founder Member and Ms. Rabia Malik, Chair & Trustee of the City Circle, a voluntary organization of British Muslims that promotes the development of a distinct British Muslim identity. It seeks to assist the process of community cohesion and integration by building bilateral strategic alliances between Muslim and non-Muslim communities and harness and channel the skills and resources of Muslim professionals into practical projects thereby facilitating and empowering young Muslim women and men to 'put back in' to the wider British community. Party’s position on Environmental Protection and Climate Change in addition to the party’s position on various national and international policies. The delegation was briefed about how the British system of local government works by Councillor Richard Kemp, Vice Chairman and European & International Portfolio Holder at the Local Government Association. On Wednesday, July 22, the Youth Parliamentarians interacted with the officers of the UK’s Foreign and Commonwealth Office and shared their concerns and ideas on UK’s relations with Pakistan and the UK’s foreign policy. The meeting involved various FCO officers from the Counter Terrorism and Public Policy departments. The Youth Parliament delegation also met with and was briefed by the Article 19 representative Ms. Sejal Palmer. The delegates exchanged a variety of views on the various policies and stances of the Article 19, a human rights organisation with a specific mandate and focussed on the defence and promotion of freedom of expression and freedom of information worldwide. In a meeting with the Amnesty International, UK’s Ms. Verity Coyle, Student action Network Coordinator, Mr. Dan Jones, Human Rights Education Advisor and Mr. Allan Hogarth, Advocacy Officer, the delegation was briefed about the mission and work of the Amnesty International, especially relating to policy liaison and advocacy with the Parliament and government. The Youth Parliament delegation held an insightful interaction with the Conservative Future, the youth movement of the British Conservative Party, for members aged up to 30 years old. Mr. Michael Rock, National Chairman of Conservative Future, an elected post, and Ms. Philippa Broom, Director International Office of the Conservative Campaign Headquarters shared various aims, objectives and the areas of the work of the Conservative Future and how the Conservative party was poised to come centre stage to lead the country. ranging from Britain’s relations with Pakistan, the freedom and liberty available to Muslims in the UK and the recent arrest of Pakistani students studying in the UK. The MYPs were part of an interaction at the Department of Communities and the Local Government, UK where they also met with the Young Muslim Advisory Group (YMAG). The YMAG, ranging in age from 16-25, works directly with the UK Government to help deepen its engagement with young Muslims. The advisors talk to ministers and policy makers first hand about the issues affecting their day to day lives. The YMAG members present at the meeting included Ms. Arzoo Ahmed, 22 from East Didsbury, Manchester who recently graduated from Oxford University with a physics degree; Ms. Farah Elahi, 20 from Willesden Green, London, and an undergraduate at the School of Oriental and African Studies (SOAS) studying Economics and Development studies and Ms. Sabiha Iqbal, 18 from Heaton, Bradford and currently studying at the Leeds University. The MYPs and YMAG members discussed a range of issues including the format and areas of work of the two respective groups, various methodologies employed by both to carry out their specific objectives, the challenging facing the Muslim community in the UK and the future of Pakistan. Both sides agreed that a deeper interaction between the two groups will be especially helpful in tackling areas of mutual concern and focus in the two countries. In another meeting at the Cambridge University, the MYPs were briefed about the work of the Democratic Audit, a research organisation of scholars, lawyers and journalists that conducts original research into the quality of democracy and political freedom in the UK. Professor Stuart Weir, former Associate Director of the Democratic Audit for 15 years and a Visiting Professor with the Government Department at the University of Essex, talked to the MYPs in great detail about the work of the Democratic Audit and its contribution in handbooks on democracy for the International Institute for Democracy and Electoral Assistance, the latest being Assessing the Quality of Democracy: a practical guide and a variety of books and reports for the Audit. The MYPs discussed in detail the idea of democracy and good governance. On the last day of the Study Visit on Friday, July 24, Members of the Youth Parliament Pakistan (MYPs) visited the Chatham House, UK, the well-known Royal Institute of International Affairs, based in St James's Square in London. Chatham House, both the name of the building and the name by which the Institute is widely known, is a leading think tank with a mission to be a world-leading source of independent analysis, informed debate and influential ideas on how to build a prosperous and secure world for all. The delegation, warmly received by Mr. Keith Burnet, Director of Communications, Chatham House, was briefed about the Chatham House’s work and mission by the Director of the Institute Dr. Robin Niblett. The MYPs received a detailed briefing on the Relationship between the MP & the Constituency in the constituency of Rt. Hon. Malcom Wicks, MP (Labour) Croydon North. The delegation, received by the Chief of Staff of Mr. Wicks, also met with the Lord Mayor of Croydon North. The Youth Parliament delegation met and interacted with the British Youth Council, an organisation lead by young people, for young people, aged 25 and under, across the UK. The BYC connect with their community of member organisations and network of Local Youth Councils, to empower all of them, wherever they’re from, to have a say and be heard. In an interaction with Mr. Joseph Sherry, National Chair, Ms. Helen Gibson, National Secretary and Mr. Tom Christian, Campaigns & Membership Officer of Labour Students, an affiliated society of the British Labour Party, the Youth Parliament Pakistan delegation discussed in detail the role of Labour Students within the decision-making stream of the Labour party, the seeming decline of the Labour Party amongst voters and what could be the future challenges for the New Labour in UK. 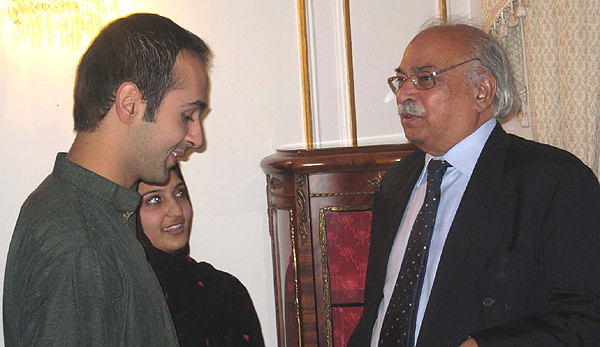 In the last official engagement of the Study Visit, the Youth Parliament Delegation was hosted by H. E. Syed Wajid Shamsul Hasan, High Commissioner of Pakistan to the United Kingdom at a dinner reception at the Pakistan High Commission. Upcoming British politicians of Pakistani Origin, including Mr. Kabir Sabir, Member Youth Parliament Pakistan Steering Committee, alongside dignitaries and the media were part of the reception. The High Commissioner praised the initiative of the Youth Parliament Pakistan and said that Youth’s leadership development was key to a prosperous and democratic future of Pakistan. Upon the completion of the Study Visit, members of the delegation are to prepare detailed Study Visit report that is to be published on the Youth Parliament Pakistan webpage (www.youthparliament.pk) in addition to penning down their experiences and learning in the form of newspaper articles for various leading newspapers of the country. A documentary of the study visit was also prepared on the sidelines of the study visit courtesy the British High Commission Islamabad which will be showcased during the upcoming session of the Youth Parliament Pakistan at Islamabad from August 05-09, 2009. The delegation will also hold discussions and debates on key aspects of learning from the Study Visit during the proceedings of the upcoming session.